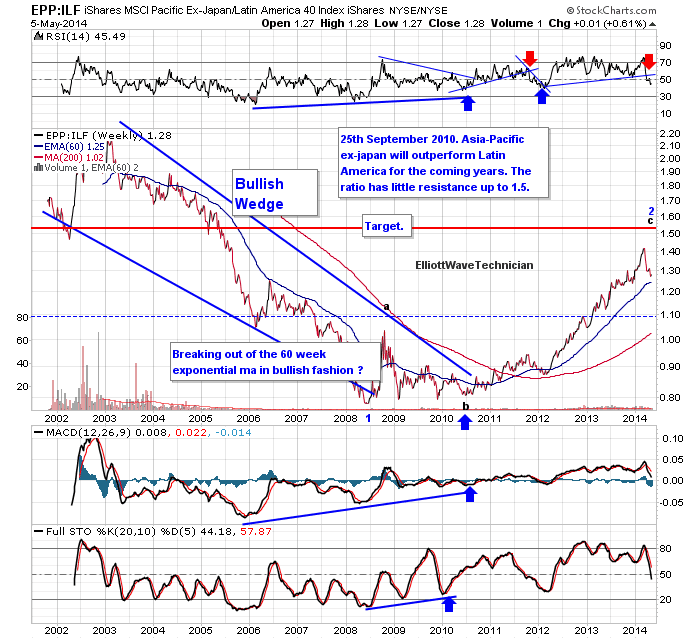 This is an update of our article "The stock market - Asia will continue to outperform Latin America" posted the 30th of January 2014. We expect a long term opportunity to arise in the Latin American stock market over the next year or so. We expect Latin America to bottom relative to Asia when the Ratio reach our target of 1.5 which represent solid resistance. The coming year is a window of opportunity to buy the emerging Latam stock market at bargain prices. The private market as well as the grey market, during bear markets in emerging countries, are usually possible to buy into for extremely low prices as the crowd as well as investment managers think these markets are worthless. Subscribe to our investment newsletter and see the Elliott Wave structure of Emerging Latin Ameria.